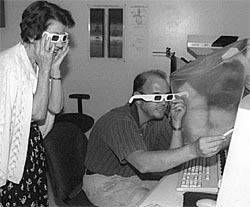 Charles Kazilek (right) of the Life Sciences Visualization Group shows Marilyn Wurzberger, head of Special Collections at the ASU Library, a magnified look at ASU's bound leaf of Leviticus14 from the Gutenberg Bible. Kazilek was able to build a special frame to protect the 500-year-old printed page while it was being scanned. The page is scanned layer by layer and creates a sharp 3-D image. Kazilek and English Professor Gene Valentine have used the scanning laser confocal microscope to view various types of paper as part of an ongoing research and art project, the Paper Project. RIGHT: Kazilek displays his scan of the Gutenberg leaf. 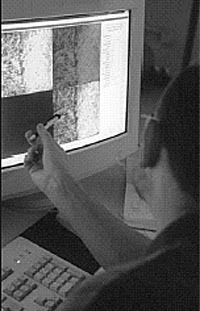 By scanning the page, Kazilek can study how the fibers are interlaced within the paper. Kazilek says the scanned image also has aesthetic interest as a work of art.